What are Lists? What are Lists useful for? If you've ever written a grocery list, you're prepared to use lists in Stencyl. In general, lists can be a good option any time you want to keep track of lots of information. Aside: Internally Stencyl uses lists to keep track of created actors, what points in a collision actually collided, and so on. If you've used any block that begins with "for each" you've actually used a list already! For Programmers: Lists are mutable lists. They are equivalent ArrayLists, Vectors, NSMutableArray or whatever you like to call them. Think of a list as a 2-column table. The first column is the index. The second column is the value. Indexes for lists start at 0, so the first item in a list starts at index 0, the second item is listed at index 1, and so forth. Don't work with indices beyond the maximum one (or below 0). Your game will crash if you do. Lists don't necesarily have to contain data all of the same type, but it is common practice to do so. If you mix up data types, it's your responsibility to keep track of this and process your data appropriately. All blocks related to lists are located under Attributes > Lists. The Future: We don't yet support reversing, combining or sorting lists, though these are all supported in a 3rd party extension. We do, however, support Maps/Dictionaries. How do you create a List in the first place? Lists can be Attributes, so like any attribute, there are two ways of doing this. 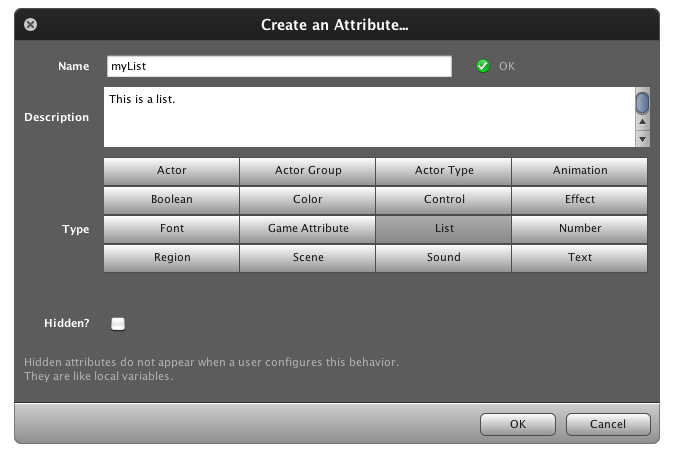 Creating it at runtime inside a behavior and setting the attribute's value to that new list. 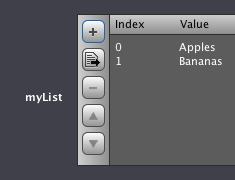 Assume that for both cases, we have created a List Attribute called "myList"
After attaching a behavior with a List attribute to either an Actor or a Scene, you'll see this neat interface for adding initial data to the list. Note: The second icon (the one under the +) lets you import a List from a text file. One line per entry. All entries will be treated as text. Alternatively, you can create a new list on the fly and begin filling it up. Lists can be used as Game Attributes. This can be pretty useful for defining stat tables and other large collections of data to use throughout the game. 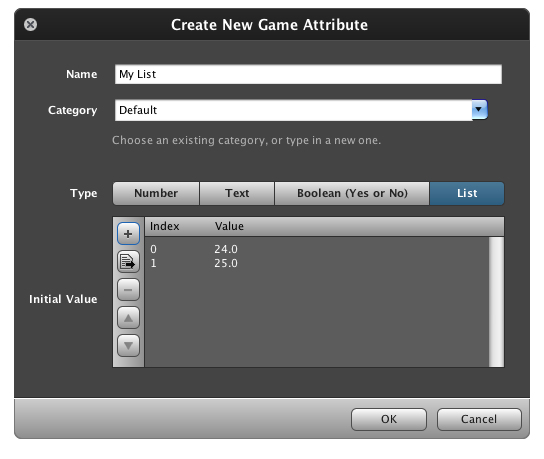 Lists can be created as Game Attributes and pre-populated the same way as other lists, namely only with Numbers and Text. Note: You are also allowed to dump in Lists into Lists at runtime as well as any other kind of data. If you plan to save your lists out (via Game Attributes), there are restrictions. Skip down to "Saving & Lists"
It should come as no surprise that you're able to set the value of a Game Attribute to a List. Note: Assigning values simply gets the Game Attribute to "point" to your List. No copying is done, so modifying it modifies the one and only "copy" of that list. As stated earlier, be careful when saving out lists as Game Attributes. They can only contain contain Numbers, Text and other Lists that follow the same rules. Lists are collections of data. Every item in a list has an index (number) that tells you where, in that list, that item resides. You can do lots of things to lists and change them after creation. Lists are great for storing sequential information, but if you need to store a "grid" of data? It turns out that lists are powerful enough that you store a List within a List, thereby bringing it up to 2 dimensions. Come up with a scenario in which you need a 2D list and implement it. Disclaimer: This challenge is just an exercise for practicing what you've learned. Part of what we're doing with Stencylpedia is getting you to think about the underlying concepts. Please do not regard this as best practice - it's just an exercise. Looking for a 2D list extension? A veteran Stencyler has created a handy extension for 2D lists. i use lists as a save file part in my game as it has 3 game save files witch are all different so you can restart and still see your other 2 saves in the load/save menu for more then one person to play. One handy tip I just came across: if you're getting a random item from your list using the "random number between" block, set the upper limit to "number of items in [list] minus 1". Otherwise, it will occasionally try to hit a slot outside your list and return "null". Do lists apply to when you're making multiple save slots in your game? I've been wasted too much time for this Very Stupid List within List. Seems that Finally I got very simple solution. Why using list of lists to make 2d array? You can easly use only one 1d list, like video memory is organised. You can no longer create a list with in a list in Stencyl 3? I've added a link to a pre-built 2D list extension that Photon created. That said, the exercise is still a good thought process to run through. Wouldn't it be easier to just store list within a list, like in last paragraph? Each item of master list could be a small list with five Number items in it, representing stat values of a weapon.